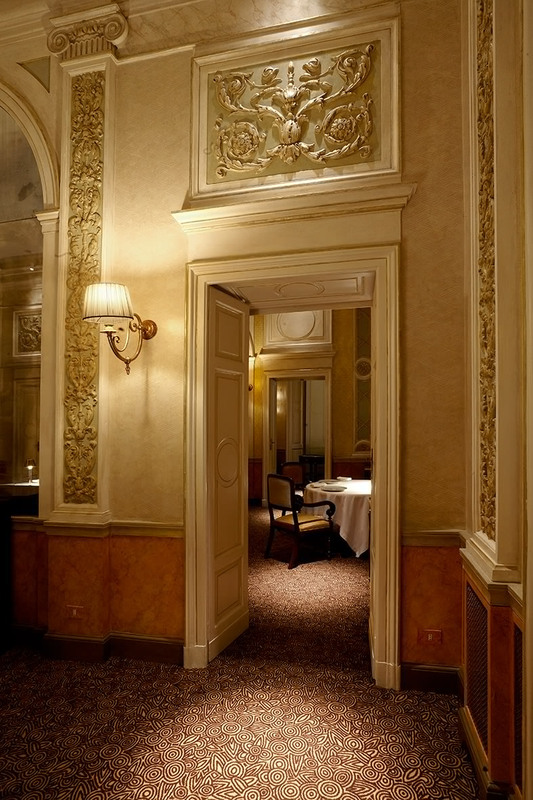 The aesthetics of a sophisticated location meet elegant architecture and innovative yet traditional cuisine: Ristorante Cracco is proof of how all these elements can coexist in the same space. Chef Carlo Cracco managed to bring together a Restaurant experience, meetings at the Café, tastings at the wine Cellar and private events in one location. An all-around culinary venue, featuring an offer that ranges from breakfast to post-theater drinks, while conveying the incessant quest for harmony suspended between tradition and innovation, characterizing his cuisine. Boasting hand-painted walls and mosaics in harmony with the exterior architecture, the Café welcomes guests in the Galleria. At the 19th century bar counter, patrons can order their ‘petit déjeuner’ or choose between brioches, pralines and chocolates, all exclusively made at the bakery located on the upper floor; a corner dedicated to the creations of pastry chef Marco Pedron. The Café also offers an oasis where to enjoy a cocktail in the dehor, surrounded by greenery, as well as an ideal spot for an informal lunch or dinner featuring a simple yet complete menu. Grey-sky blue boiserie introduces the three rooms and the two privé areas of the restaurant located on the first floor, revealing spaces that find and express their hidden value. The menu offers unexpected dishes, such as fish soup crust and yolk marinated with asparagus and black truffle, as well as more traditional options, such as saffron risotto, grilled bone marrow and liver ragout. The Ristorante offers a sophisticated menu, that includes oysters, caviar spaghetti and a special selection of Spigaroli, for the Art Deco-inspired Fumoir, enhanced by walls covered in moss green metallic threading. On the basement floor, the exceptionally captivating and rich wine cellar features fir and glass shelving surrounded by lacquered red walls. Over 2,000 labels and more than 10,000 bottles of mainly Italian and French wines, intended for sale as well as tasting. A special place featuring an exclusive access reserved for private events. Designed as a theater backdrop, thanks to its lack of fixed furnishings -except for the 1920’s inspired large Levanto marble bar counter – this area on the 2nd floor allows for the creation of a fully customized space. In collaboration with Sky Arte and Cantine Ferrari, the project Galleria Cracco brings together some of the most important Italian and international contemporary artists to create site-specific works for the ‘lunettes’ over the shop windows of the mezzanine level. The three windows will be visible day and night to visitors of the Galleria. Patrick Tuttofuoco’s Heterochromic inaugurated the project that blends art and cuisine, introducing a profound reflection, deeply correlated to the concept of identity. 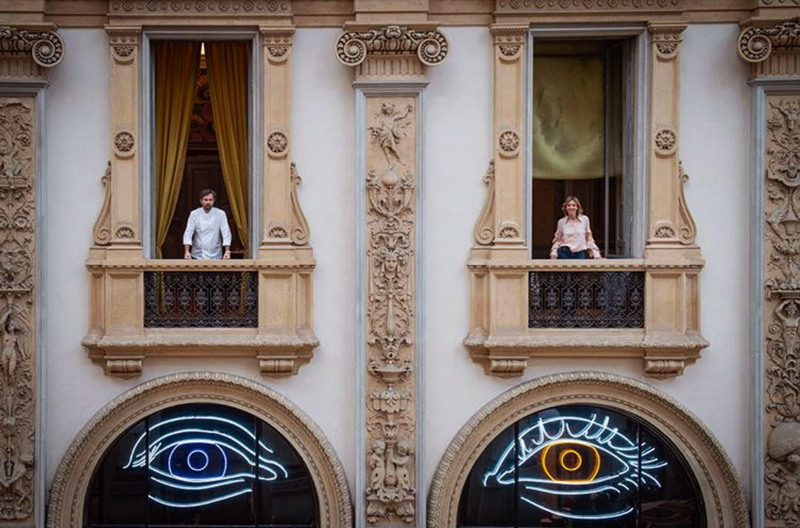 Utilizing neon, the artist transformed the two lunettes into eyes – the eyes of Carlo Cracco and Rosa Fanti – creating a unique entity that combines different irises. The decision of representing sight stems from shared findings from Tuttofuoco and Cracco’s respective research: although using different tools, both are connected by common aesthetic research and by the resulting need to communicate and share. Cafe is open all day 7 days a week.